This account is intended to provide both inspiration and information to anyone taking on an abused or poorly socialised cat. It shows how perseverence, patience and understanding can undo the effects of neglect and abuse. Nutmeg belongs to my friend Doug. She is a tortie-tabby and white with almost symmetrical areas of ginger and tabby. He refers to her as being "two cats stitched together - a tabby one and a ginger one"
As a kitten, Nutmeg was shut in a shed and expected to catch mice and rats. To make her keen for the hunt, she was rarely fed. Not only do well-fed cats make better hunters, but Nutmeg was still a kitten and certainly not capable of attacking vermin or fending for herself. Doug's comments are in italics. "She's a strange cat, she spent the first year of her life locked in a shed without contact or food. Obviously, a pitifully weak starving kitten is going to be a champion rat catcher, isn't she ?" She was rescued by Cats Protection and by then was a de-socialised, undersized cat (no longer used to human contact) with a number of behavioural problems. She was placed in homes four times, but each time her behavioural problems caused her to be returned. Finally Doug walked into Nutmeg's life. Doug is a big guy with an even bigger personality and plenty of cat-sense and he knew that Nutmeg would not behave like a normal cat. "When I first got her, she had absolutely no concept of how to play, she wouldn't allow herself to be touched, yet she craved companionship. She would follow me around the house, walking to heel. She would cry and wet herself if any door was closed. She would become highly distressed if her bowl wasn't absolutely FULL of food all the time." At first Nutmeg was so anxious that if she encountered a closed door she wet herself. If her food-bowl was empty she wet herself. She had been so play starved that if presented with a new toy or game, she became obsessed with it for days or weeks. She did not like prolonged petting sessions, but unlike the other four homes, Doug learnt Nutmeg's body language and knew when to stop before she bit him. And she bit him often, but instead of pulling away, Doug left his hand in Nutmeg's mouth so that she learned that biting did not get a reaction. He went around with a lacerated hand for a while, but his lack of reaction meant Nutmeg learned not to bite quite so quickly. "While she always sat next to me on the sofa, she wouldn't let herself be stroked. After the first stroke, she would glare at me, the second stroke she would roll away, and the third stroke she would bite and scratch. It took three months of a torn and bloody right hand before she finally got used to it, and would just lick me to warn me away." Nutmeg also learned that closed doors were not a source of terror and that food-bowls would be replenished. She knew that Doug was her friend and she attached herself semi-permanently to his ankle as he walked around the house. She also became fascinated with running water - leading to the embarrassing "don't wee on the cat" incident (now a long-term joke among Nutmeg's fans). Accompanying Doug to the toilet one day, Nutmeg sat on the edge of the toilet bowl transfixed by the yellow stream. She was a little too transfixed and suddenly there was a rather damp, smelly and slightly repentant cat in the house! Although Doug had a garden, his neighbours had an out-of-control dog which entered his garden and attacked the cat. Although the dog came off worse, remember that it was not under control and would have killed the cat. 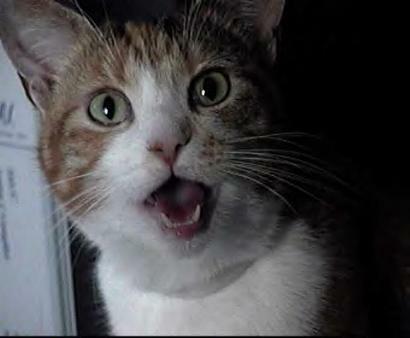 "An angry cornered cat is quite a sight to behold. My cat, Nutmeg, is a tiny little moggie - she was a rescued cat that hadn't been properly fed, so she's really small. Shortly after them "people" next door (loose application of the term) moved in, one of their dogs decided to chase her, and cornered her round the back of my kitchen. I heard the ruckus and started downstairs, unlocked the back door and went to see what was happening - probably took around a minute in total. Nutmeg had jumped on the face of the dog (or the dog had tried to bite her, I don't know) and sunk her front claws and teeth into the back of its neck. She was pedalling furiously on the dogs eyes and snout with her back legs. As soon as she saw me, she jumped onto me and firmly attached herself. The thing I remember most is the incredible noise - Nutmeg was growling like nothing I've ever heard before, an absolutely chilling noise, but even that was overshadowed by next door's labrador, it wasn't growling, barking or crying, the only way I can describe it is as a noise of pure terror. The dog was rushed to the vet, but had to be put down; it had lost both eyes, the black part of its nose, and had most of its face shredded. Nutmeg was physically unhurt, but suffered such a shattering blow to her confidence that she wouldn't venture outside for six months or so." When Nutmeg did start going outside again (where she loved to bask on the pavement and greet passers by), one of the neighbours deliberately ran her over, crushing her tail and actually stopping with the tyre pinning down her tail so that she shredded her claws while trying to crawl free. Part of her tail, corresponding to the width of the tyre, was flattened. Luckily it healed and she regained full use of it. 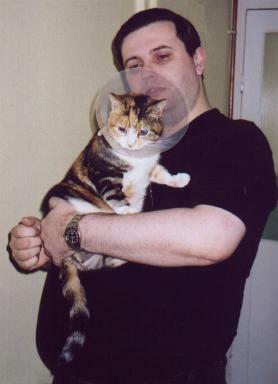 Later, Doug moved to Bristol (where I met him and Nutmeg while visiting colleagues) and on her first trip outdoors she got into a fight with another cat and gashed her paw hence the Elizabethan collar. Although a little anxious of prolonged petting and fed up with her Elizabethan collar, she was a delightful and friendly cat who wanted to sit on my lap and Doug's lap simultaneously. It's certainly an icebreaker and an interesting way to get to know people when you have to sit close so the cat can sprawl across two laps! Doug calls her a tortie tart because she'll sleep with anyone - I was camped downstairs in a sleeping bag and she quickly took up residence on my feet. Even better from her point of view was that I'm an early riser (6 a.m. or earlier) and like an early morning cup of coffee and this meant Nutmeg got an early breakfast and a cuddle! "Now, five years on, she's full of beans, sleeps between my legs on top of the duvet, hunts well (whenever I forget to lock the cat flap at night), and can play without claws. She's a NICE CAT. However, every now and again, you catch a glimpse of pure untamed viciousness that I'm sure is present within all cats, but they love us too much to frighten us with it. I'm not suggesting that cats are harder than dogs, just that cats are not the cute defenceless fluffy fun-bundles that they would have us believe. They just fake it REALLY WELL."